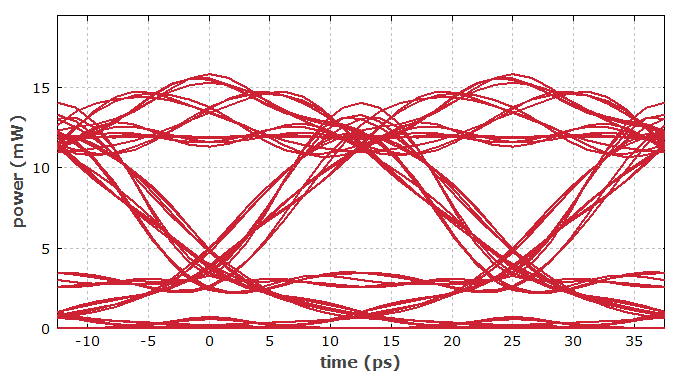 Here, we simulate the transmission of a data signal in a glass fiber. 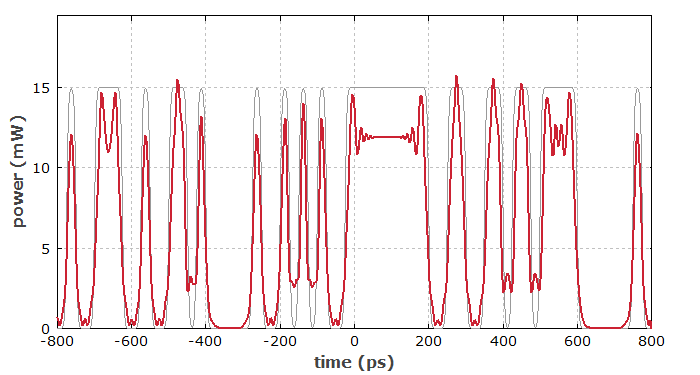 The mode parameters of the fiber are calculated with the mode solver from a given germanium doping profile. A pseudorandom NRZ (non return to zero) signal with 40 Gbit/s is created and propagated through 5 km of the fiber. Figure 1 shows the signal before and after the fiber. There are substantial signal distortions, caused mainly by the chromatic dispersion and to some extent also from the Kerr nonlinearity. Figure 1: Time-dependent power of the pseudorandom bit sequence before and after the fiber. Figure 2 shows an eye diagram. As the “eye” is wide open, the signal could still be well detected. For twice the fiber length (not shown here), this would be different. Figure 2: Eye diagram for the telecom signal after the fiber. Of course, one could easily include further aspects in the simulation, for example a chirp of the input signal.